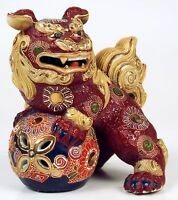 FOO DOG. GLAZED PORCELAIN AND GILDED. KUTANI. JAPAN. BEGINNING 20TH CENTURY. Large Antique Floral Japanese Satsuma Pottery Vase - Hole In Bottom - 15 3/8"